Daisy Lee Gatson Bates was born on November 11, 1914. She grew up in southern Arkansas in the small sawmill town of Huttig. She was raised by the closest friend of her father, who had left the family shortly after her mother's death. In The Death of my Mother, Bates recounted learning as a child that her birth mother had been murdered by three local white men. Learning of her mother's death and knowing that nothing was ever done about it fueled her anger. Daisy was 15 when she started dating Lucious Christopher Bates, an insurance salesman who had also worked on newspapers in the South and West. They dated for several months before moving to Little Rock (Pulaski County) in 1941; they were married on March 4, 1942. Bates became President of The Arkansas Conference of Branches in 1952 at the age of 38. She remained active and was on the National Board of the NAACP until 1970. Due to her position in NAACP, Bates' personal life was threatened much of time. In her Autobiography, Bates discussed her life as a president of the NAACP in Arkansas. As the leader of NAACP branch in Arkansas, Bates guided and advised the nine students, known as the Little Rock Nine, when they attempted to enroll in 1957 at Little Rock Central High School, a previously all-white institution. The students' attempts to enroll provoked a confrontation with Governor Orval Faubus, who called out the National Guard to prevent their entry. The guard only let the white students to pass the school gate. Eight students out of the nine were asked to go back home. But a student called Elizabeth Eckford who didn’t receive the message from Daisy Bates last night met a mob, when she was trying to find other eight students in that morning. White mobs met at the outside of the school and threatened to kill the black students; these mobs harassed not only activists but also northern journalists who came to cover the story. Congressional Gold Medal posthumously awarded by President Bill Clinton along with other members of The Little Rock Nine in November 1999. 1 2 3 4 Bates, Daisy (October 11, 1976). "Interview with Daisy Bates". Southern Oral History Program Collection. Documenting the American South. 1 2 3 Calloway, Carolyn; Thomas and Thurmon Garner (May 1996). 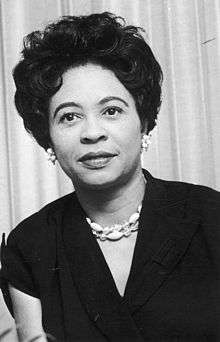 "Daisy Bates and the Little Rock School Crisis: Forging the Way". Journal of Black Studies. 5. 26: 616–628. doi:10.1177/002193479602600507. 1 2 3 Stockley, Grif. "Arkansas State Press". The Encyclopedia of Arkansas History & Culture. Retrieved November 1, 2013. ↑ "Candace Award Recipients 1982-1990, Page 1". National Coalition of 100 Black Women. Archived from the original on March 14, 2003. ↑ "Charles Blake". arkansashouse.org. Retrieved April 16, 2015.